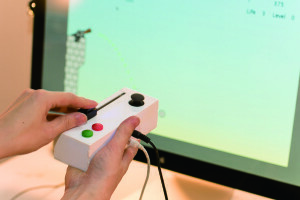 Tapcon is an energy-efficient game controller which utilizes tactile presentation techniques. By using this tactile presentation, we developed original games with improved realism. By using a motor fader with sensors and actuators, we were able to produce a light-weight controller with reduced power consumption. Additionally, we created two games where this controller can be used: a digging action game, where the intensity of vibration changes depending on the hardness of the ground; and a bow and arrow shooting game, which presents a tactile experience of actually pulling the bow and arrow.